HP LaserJet 1005w is one of the latest HP product among all the other HP printers. The device is well suited for home users. The device has an eye catching attractive design and comes in cream colour with fine looks. The printer weighs approx. 7 kg measuring 16.3 x 19.1 x 10 inches. The maximum print resolution of HP LaserJet 1005w is 1,200 x 1,200 dpi. It is having a print speed up to 14 ppm for standard A4 sheets of paper.The device supports various media types such as plain paper, transparencies, stickers and photo papers. The device produces clear text printouts and it also supports ease of maintenance.It has a large paper tray which can store up to 250 sheets of paper. The laserJet 1005w has a reliable HP print engine to rely upon during heavy workload and large print volumes. HP LaserJet 1005w printer is a perfect solution for home users. The high paper handling capacity of the device is a great advantage. The device is simple to use and easy to maintain. As far as the budget is considered this device is expensive to look for. Also, its limited features can put off many of the tech lovers. However, single colour HP LaserJet 1005w toner cartridge increases the running cost of the printer. How to fix toner smear appearing on the top of the printouts? Printing issues are very common for any HP laserjet printer and so do their solutions. After a while the printers start making poor prints with smears, smudges, blanks or ink spots etc. This can either be a result of low level or faulty HP LaserJet 1005w toner cartridge, or poor quality or damaged sheets or may be blocked printheads. These things are really common and very easy to get rid of. Try installing a new HP Laserjet 1005w toner cartridge. If the problem wasn’t caused by the print media, it might be the issue of a faulty toner cartridge. Replace the HP Laserjet 1005w toner cartridge and try making prints. Q. My printer usage is very heavy. Do you provide any higher capacity HP LaserJet 1005w toner cartridges? A. Yes, we have got higher capacity HP LaserJet 1005w toner cartridges. These are called HP15X (C7115X) cartridges and have the capacity of printing of 3500 pages each compared to the HP15A (C7115A) cartridges that are capable of 2500 pages each. Q. What can I expect to receive in the box of this printer? A. You will receive the HP main unit, HP LaserJet 1005w toner cartridges, Getting Started Guide, Software and electronic user guide CD, power cord and an HP warranty. Q. What is the printing speed offered by the HP LaserJet 1005w printer? A. This printer can print up to 14 pages per minute. Q. I want to purchase HP LaserJet 1005w toner cartridges in bulk. Can you provide guidelines on storing these cartridges? Store your toner cartridges at or below room temperature. You must store the store toner cartridges in a room with relatively low humidity. You should only remove the toner cartridge from its package when it is ready for use. The cartridges should not be exposed them to too much light. Q. What interfaces can be used to connect the HP LaserJet 1005w printer? A. The interfaces supported by the HP LaserJet 1005w printer are Parallel and USB. Q. How are toner cartridges different from ink cartridges? What type of cartridges does HP LaserJet 1005w printer use? A. Toner cartridges are filled with powder that may include materials like polymer, wax, carbon powder, resin, etc. Toner cartridges are used in laser printers whereas ink cartridges are designed for inkjet printers and contain liquid ink. Toner cartridges are comparatively cheaper since they can print more pages relative to their cost and are better prepared to handle high volume print jobs. This printer uses toner cartridges for its operation. Q. What is the paper tray capacity of HP LaserJet 1005w printer? A. 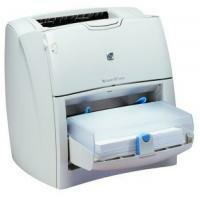 The paper tray of this printer can hold upto 250 sheets of paper. Q. How many colours are available for HP LaserJet 1005w toner cartridges? A. As the printer is monochrome in nature, it is available with only black colour toner cartridge. Q. Are HP LaserJet 1005w toner cartridges compatible with other HP LaserJet printer models? A. Yes, these cartridges are compatible with HP Laserjet 3320n, HP Laserjet 3330, HP Laserjet 1000w, HP Laserjet 1005w, HP Laserjet 1200, HP Laserjet 1220, HP Laserjet 3300, HP Laserjet 3320, HP Laserjet 3380 and other models. Q. What are the key features of HP LaserJet 1005w printer? High quality black and white laser prints. Fast print speed, ie 14 pages per minute. 1200×1200 dpi maximum print resolution. Q. Is the printer capable of handling heavy workloads? A. Yes, the LaserJet 1005w has a robust and reliable print engine, which enable the printer to handle heavy workloads and large print volumes. Q. Is it possible to connect USB to this printer? A. Yes, there is a USB port available in this printer, through which the user can easily connect the computer to the printer. Q. Will the use of compatible HP LaserJet 1005w toner cartridges void my printer’s manufacturer warranty? A. The compatible HP LaserJet 1005w toner cartridges are guaranteed to be free from any complications and won’t affect your printer’s manufacturer warranty. Q. How would I come to know whether the product I want, is in stock or not? A. To know whether the product is in stock or not, select the product. After that the page opened will let you know the current availability status of the product. To know further you can also call us on 048 3083 3221 or email us at info@printerinkcartridges.ie. Q. I want to know that is there any difference in the print quality and page yield when I use compatible HP LaserJet 1005w toner cartridges for my HP LaserJet 1005W printer? A. In comparison to the genuine cartridges, there is not much difference in the performance or the print quality of compatible HP LaserJet 1005w toner cartridges. All of our compatible toner cartridges are tested to the highest quality standards. This ensures that one gets the same high-quality printouts and page yield as the original HP toner cartridge gives out. Our compatible HP LaserJet 1005w toner cartridges are available with a money back guarantee so that you can always claim your money back if you do encounter any problems using them. Q. Why do the HP LaserJet 1005w toner cartridges not fit into my printer? The cartridge used by you has been discontinued and replaced with a newer cartridge which is still compatible with your HP LaserJet 1005w printer. You have been sent a higher capacity cartridge than the one you were using previously. The model number on the box is the compatible manufacturer's code rather than the original manufacturer's code. Q. Can using compatible printer cartridges cause problems for me? A. No, most of the issues can be resolved with simple methods or steps that can be done at home, such as running a printhead cleaning cycle, wiping the chip to ensure it is clean and making sure that the toner cartridge is mounted correctly in the printer. You can contact our customer support team if you need any help.